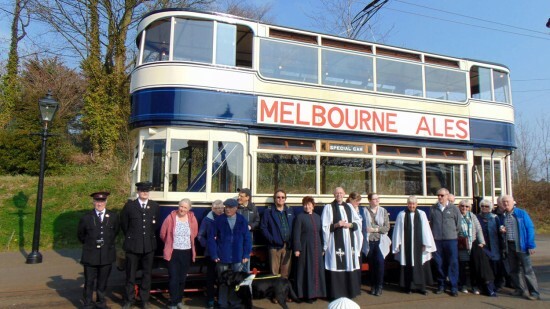 The Parish of Crich and South Wingfield – which covers the area around the Crich Tramway Village – has a new vicar and to celebrate the fact he went for a tram ride and had his reception at the museum with Leeds 345 doing the honours. The Rev Ian Whitehead is the new priest-in-charge at St Mary’s Church, Crich and All Saints South Wingfield in the Diocese of Derby and was licenced as such at a special ceremony on Monday 8th April which included a post event reception at the Crich Tramway Village – plus a tram ride on Leeds 345 after the museum had closed to the public. The Rev Ian Whitehead prepares to board Leeds 345.